Today, we were meant to be trying F.O.G. ECW with Jimi, sadly, Jimi got his hand injured at another club in a freak accident, so is Hors d' combat for a week or so! We had not done a Coastal Forces game in a long while, so we got the little ships out again! Just for a change, we used Higgins 78 footer PT boats to attack a German convoy! We used my rules Coastal Forces rules - Tyneside Wargames club - the solo rules included ran the Germans. 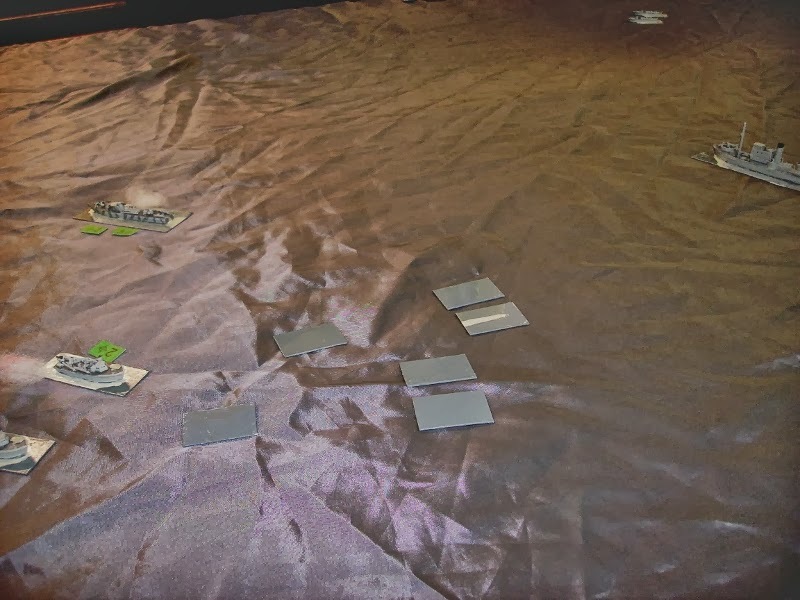 We used a mix of markers representing ships and some dummies, then removed some of them from the mix so we had no idea what we were facing, or where they were! The markers (a third are dummies) representing the German convoy and its escorts. Lawrence placed his boats near the front of the convoy. ..And mine were near the rear. My ships rapidly spotted a marker. This became an 'R' boat, dangerously armed with 20mm and 37mm cannons which outgunned my boats. Lawrence failed to see anything! Ians boats, still unseen, turned towards the front of the convoy. Lawrence pushed on to close the distance and make spotting easier. Ian spotted a Verpostenboote (VP boat) to the rear of the 'R' boat. Unfortunately for me, as I closed, the 'R' boat spotted one of my boats. Still unseen by his 'R' boat, Ian fired some torpedoes (and dummy markers) at it. Lawrence split his boats to look for targets. He spotted a VP boat..and a freighter! My boats had only spotted and been spotted by the 'R' boat and a VP boat. Hard targets! long range fire from the VP's 88mm was ineffective. Ian was having the same trouble as me, only spotting the escorts. Ian's torpedoes approached the unsuspecting 'R' boat. A second hit the 'R' boat but failed to explode...but a second wave of torpedoes were coming! The 'R' boat headed forward to comb the advancing 'fish'. My boats managed to straddle the 'R' boat that was shooting at me. We swept past the enemy ship, and got a hit on the 'R' boats bridge. A torpedo I had fired hit the VP boat that had shot at me, but again it was a dud! 1 torpedo hit, and caused a lot of damage. the ship was virtually dead in the water. Ian had spotted a second merchantman behind the first. A hit on the bow damaged the ship. A hit amidships was another dud! My boats, leaving the out of control 'R' boat behind, fired all my remaining torpedoes at merchantman Ian had damaged. The ship broke in two, and began to sink! A VP boat engaged Lawrences boats, straddling one. Behind it, the freighter went to its watery grave. My boats, with no more torpedoes, cut and ran for home. Lawrences boats shot their last torpedoes at the second freighter. My torpedoes caught the crippled freighter which exploded!. Undamaged, all the US boats melted of into the darkness..and home! It was interesting using the American boats, their heavy torpedo armament allowing players to shoot less carefully! We managed to destroy the Axis convoy, a great victory! ...and good fun to play as well! We deployed our SE5a's in an extended line facing them. Both sides raced towards each other. Due to an order error, Gareth ended up behind his wingmen! Jimmy (left) and Ian outflanked the Boche formation. They homed in on an Albatross. Lawrence (top), Phil and I engaged the Roland and 2 Albatrosses. Jimmy managed to lock on an Albatross as they turned. The Roland turned hard and got a good shot on Phil. It then got me in the rear gunners sights! ..with Ian guarding his flank. I was trying to shake my pursuer, not for the last time this day! A last shot from Jimmy sent the hapless Albatross down in flames. The Roland and 2 Albatrosses were sweeping round in a tight formation. The SEs had to try and evade as the Germans could turn inside them. I managed to turn on an Albatross and got a good hit. The dogfight was becoming a furball! The Roland and Phil went nose to nose. 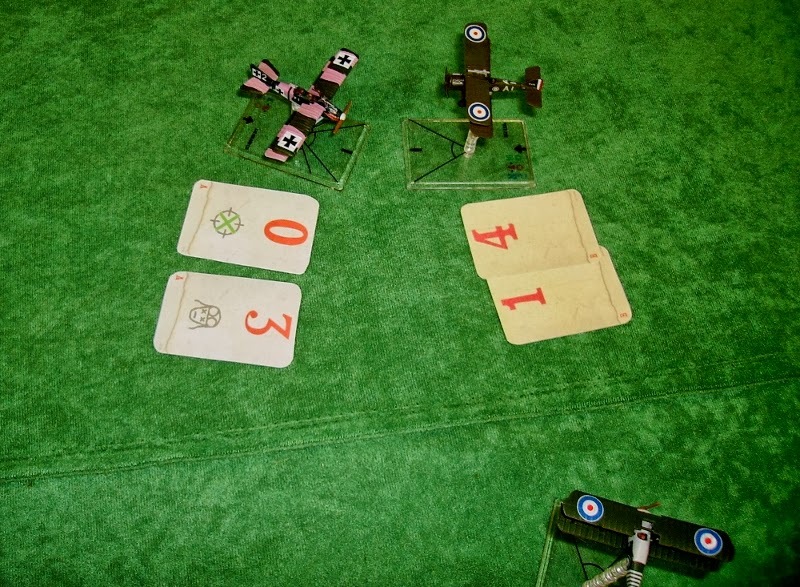 That Roland rear gunner was still causing mayhem, hitting Lawrence for 3 pts! His next shot failed to damage me as I flew by. Jimmy, meanwhile had latched on another Albatross. We were all circling for a good shot. The Roland hit Ian, that rear gunner again! Lawrence got his first shot of the day! Jimmy continued harrying the 'Red' marker Albatross. I ended up on top of Phil as we rejoined the battle! Ian, Lawrence and Gareth were having trouble getting the enemy in their sights. Jimmy had no such problems! Gareth found the nose gun of the Roland was dangerous too! Jimmy had his Albatross on the run by clever flying. A final shot got him his second kill of the day! Jimmy then turned and engaged a third Albatross! Lawrence managed to escape, and lived to fight another day! Despite their losses, the Germans were holding their own. The Roland got a good shot at Jimmy. Gareth was bracketed between two Albatrosses. The Roland was, temporarily, unable to shoot anything! Jimmy continued shooting his third Albatross up! The Roland began chasing me. Ian got a good position but failed to hit the blue Albatross. Ian closed with another Albatross..and missed again. Phil got a good hit on the blue Albatross, but it hit Jimmy. Next move Jimmy hit yet another Albatross! Ian followed up as the Albatross evaded, and jammed his guns! Gareth got the worst of a nose to nose. 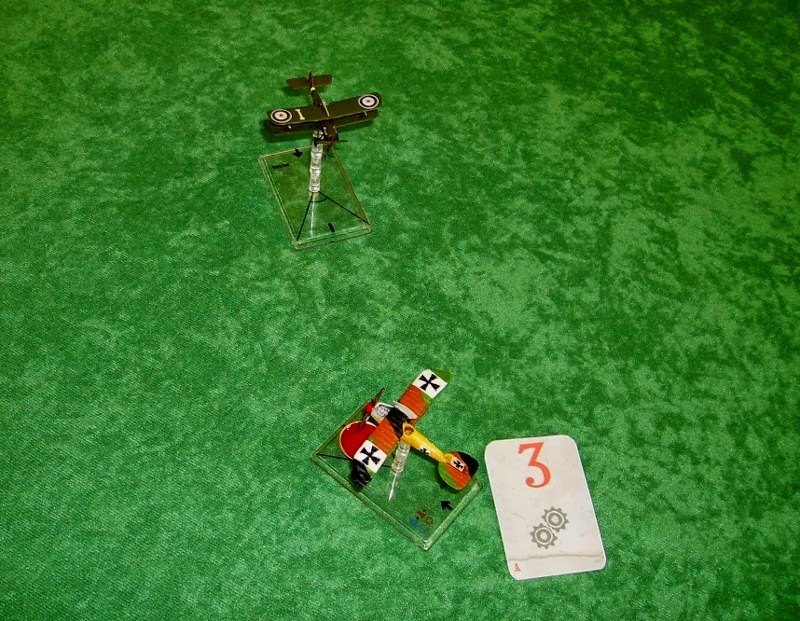 He followed round and had another bruising encounter, but this time he killed the Rolands rear gunner! We were definitely getting the best of the fight now..
Phil got on the tail of the Roland, and without the rear gunner to worry about, began to hit it! The SEs speed allowed him to close quickly. Jimmy managed to lock onto another Albatross. Jimmy, meanwhile, was still shooting well! I, nearly hampered by Ian, managed to hit a damaged Albatross. Phil was engaging the other one.. It went down in flames. At the same time, I closed with my Albatross, and killed it too! ..While Jimmy (again) - killed the Roland! The battle ended unusually, as in the campaign rules, the Germans would have broken off after 50% losses, but we got all 5. We were lucky with the 'Bang' results though, had they been kills we may not have won at all! Ah, the fortunes of War! Spanish Fury: Very Civile actions try out.